Accessibility overlaps with other best practices such as mobile web design, device independence, multi-modal interaction, usability, design for older users, and SEO. 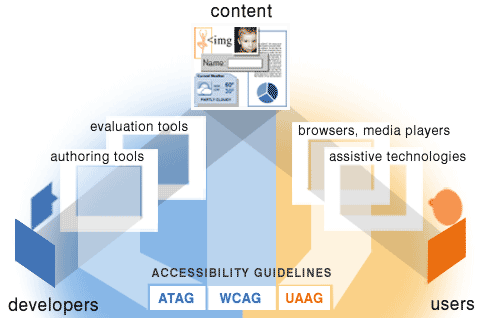 Here's a checklist for WCAG 2 from WebAIM. Make it easier for users to see and hear content. This includes separating the foreground from the background, color choice, and zoom. Help users navigate and find content. Also make it clear to users where they are. Help users avoid and correct mistakes. Provide input assistance. Maximize compatibility with current and future user tools, including assistive technology. A useful infographic from WebAIM with a checklist for developers. ARIA has been around since HTML4 and works with HTML4, XHTML and HTML5. Roles used in ways like these examples are navigation aids for machine readers and for assistive devices such as screen readers. Here's an example layout using ARIA roles. Other landmark roles can be used multiple times per page. The example pages uses divs for everything. There are semantic HTML 5 elements that make more sense that could be used instead. Ensure all content resides in a landmark region so no content is orphaned. This way a screen reader user can safely use landmark navigation without missing content. Since this table was made, a <main element> has been added to HTML5. The ARIA role="main" should be used with it. The whole site doesn't need a redesign. For now, using aria-required="true" with this HTML5 attribute is a good idea. Be sure you identify form fields with a <label> element. Do you have a specific need I haven't mentioned?